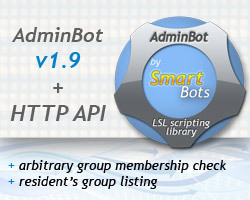 SmartBots HTTP API and AdminBot LSL library have been expanded by two useful commands today. HTTP API commands set have been extended by adding a new avatar_groups command. This command returns all visible groups of SL resident (both group UUIDs and names). The command is powered with filter parameters to fit to LSL http reply (2048 bytes). AdminBot LSL library has got a new command and a new event. The new command SB_AVATAR_GROUP receives two parameters: the group name (or UUID) and avatar UUID. The library checks if avatar is a member of the group and returns a reply to your LSL script using a new SB_GROUP_CHECKED event. You can find the commands’ details in SmartBots documentation by clicking on the links above. AdminBot LSL example is also available here. P.S. We’ve completely refined the AdminBot Commands documentation page for your convenience! Now each AdminBot command has its own description page (with examples, too).